Thanks to Chris Samnee for asking me to join this fine collective. I'm not sure what I'm doing here, honestly -- a colorist in the midst of you graphite and ink monsters. Maybe I'm like the average dude who's put in a photo of the world's tallest man just for scale. 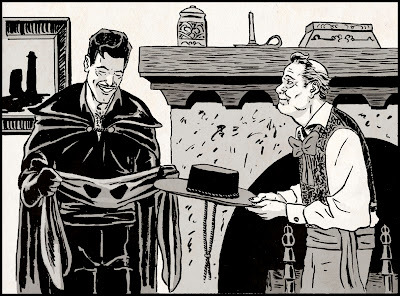 Even if that's the case, I'm just pleased and honored to be here and hope my own humble drawing of Don Diego de la Vega and his faithful mute manservant, Bernardo, doesn't lower the tone too much. Nicely done sir. I like all the reeeaaallly subtle tones. Give yourself some credit, though. This is a really lovely piece, sir! This is great. I really like this nice casual scene. Thanks, guys! You're too kind! Stop selling yourself short! This is a lovely piece. Yeah, I agree. I dig the hell out of a quiet moment. AND it's really well done! Man... this is absolutely gorgeous. Definitely one of my faves. I love it. It shines amidst all the action pieces. The little moments are always my favorite moments and you captured one perfectly. Agreeing with Mitch here, this is the kind of quieter piece I hope we get to do a little more of around here. And Bernardo is awesome. Wonderful, wonderful job there Nathan! Truly terrific!